The latest changes to VAT and profit tax legislation, implications of recent measures taken to fight fiscal evasion, changes to international tax reporting rules and the need to improve holding legislation were some of the topics discussed by participants in BR’s 14th Tax & Law conference which took place in April. 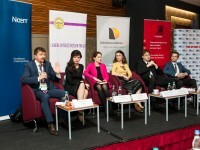 …Talking about tax inspections, Luisiana Dobrinescu, lawyer with Dobrinescu Dobrev SCA, said the authorities generally have a ‘presumption of guilt’ approach and many of the measures taken against firms suspected of fiscal wrongdoings are not only counterproductive but often abusive. “We need the legislation to support the fight against tax evasion, but this should not generate collateral victims. The existing legislation disadvantages taxpayers in relation to the fiscal authorities,” she stressed.